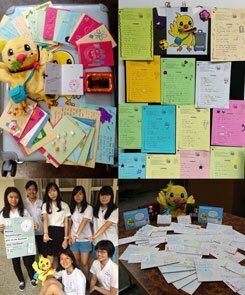 School students in East Asia are developing projects in GFL lessons with the help of the PASCHi mascot. In this context the young people acquire the necessary project skills with support from their teachers, using the "Easy-to-difficult" principle. Project-based learning concentrates on delegating more responsibility to the students for planning their own lessons, and giving them an opportunity to develop (language) products creatively. In countries with different, non-Western or non-European teaching and learning traditions it’s a good idea to introduce forms of task and project-based learning gradually. For this reason the teacher’s notes for project-based learning with PASCHi in beginner lessons start by integrating micro-projects that can be completed within one or two periods into the regular curriculum. The important thing is that the learning opportunities are directly relevant to the students’ lives, and that lesson content involves the outside world (Wicke 2012: 210; Benkelmann-Zhang 2016: 45-45). PASCHi the parrot is the mascot of the schools supported by the Goethe-Institut in the “Schools: Partners of the Future” (PASCH) initiative in East Asia. He was designed by two Taiwanese schoolgirls in a design competition. The Goethe-Institut in China produced the glove puppet mascot after a vote on PASCH-net, and sent PASCHi off on his travels in February 2016. The eloquent parrot visited a total of 27 schools in China, Hong Kong, Taiwan, Mongolia, Korea and Japan. Not only does the glove puppet “speak” German to the school pupils, he also introduces ideas for planning project-based GFL lessons in which the young people play quite an active role (Salomo/Mohr 2016: 146-168). First of all the resources invite youngsters and their teachers to get to know PASCHi through a selection of activities by way of a gentle introduction. For example the students might begin by guessing some facts about the mascot, exchanging descriptions and creating word collages about PASCHi, as well as filling in the gaps in texts and poems. In the second part, the focus has already shifted to more complex German-learning activities. Learners conduct interviews and gather information about their own school experience to make personal profiles. These tasks help to consolidate and develop fundamental language forms from the beginner lessons. Also the young people are introduced to partner and group work, as well as forms of ad lib speech, presentation and creative work. In the third and fourth parts, learners look at the planned interaction between the schools. This enables the students to experience the foreign language not just as a school subject, but also as a connection medium to facilitate understanding. In authentic communication situations they work together on projects and as a result are motivated to be more intensively involved with the foreign language. In this context, tasks with a modular structure help them to handle their own and other people’s expectations of interaction and culture. After that there is a discussion about the interactive potential of various lesson products, such as illustrated stories, comics or bags decorated by the students, which convey different perspectives of the school day, features peculiar to urban and rural locations, as well as cultural characteristics from the pupils’ point of view. The collection contains instructions on project planning and implementation for the teachers. The focus here is on the youngsters’ independent work and how well they organise themselves, the altered role of the teacher, and product orientation in project-based learning. Feedback from the young people and their teachers, as well as the reports, photos and videos published on their project blog, show how thrilled they are to meet PASCHi. Interacting and working with the parrot motivates school students in German lessons on A1 or A2 courses to achieve extremely highly. For instance German learners in South China carried out a remarkable micro-project: they used the tagline “PASCHi im grünen Bereich” (PASCHi in the green zone) to look at issues relating to the environment, nature and sustainability. The schoolchildren learnt specialist vocabulary and conducted video interviews that they published on the internet. The example shows that Content and Language Integrated Learning in German (CLILiG) is possible even when learners have minimal language skills. At the same time the mascot facilitates meetings and interaction with other German learners from PASCH schools in East Asia. Every German class prepares a reciprocally-structured project for a school from a different cultural environment in East Asia. For instance Korean youngsters gave PASCHi letters they had written themselves to take with him to Eastern China. “The next exciting project for students at my school will now be to compose a response in German, and thus perhaps begin a regular active correspondence,” the Chinese German teacher told us. Products made by the learners | Photo: © Goethe-Institut Beijing All projects so far show how quickly the students lose their inhibitions when they meet PASCHi and use their German skills openly and enthusiastically. Because the young people work independently on the projects, they are particularly involved and motivated. The resulting products are impressive, such as PASCHi songs they have written themselves, videos, photo collages, postcards and decorated fabric bags – this is an easy way of allowing the youngsters to experience success and enable them to interact with other German learners. Benkelmann-Zhang, Karin (2016): Projektarbeit motiviert nachhaltig – Beschreibung einer besonderen Art der Theaterarbeit in China. In: Fremdsprache Deutsch, issue 54, p. 43-46. Salomo, Dorothé/Mohr, Imke (2016): DaF für Jugendliche (series = Deutsch Lehren Lernen; 10). Munich: Klett-Langenscheidt. Wicke, Rainer E. (2012): Aufgabenorientiertes und projektorientiertes Lernen im DaF-Unterricht: Genese und Entwicklung. Munich: iudicium-Verlag. Karin Benkelmann-Zhang is a PASCH project leader and teaching expert at the Goethe-Institut China, and is responsible for PASCH schools in China. Dr. Rainer E. Wicke is an author specialising in task and project-based learning, an important prerequisite for cross-curricular GFL teaching.